Beverage processing plants do have a couple things in common with our other core markets – a harsh processing environment and the need for fast, efficient product changeovers. 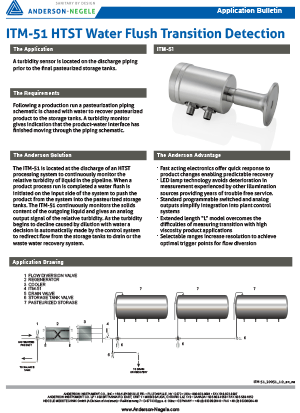 The Anderson-Negele product line is uniquely well-positioned to provide the longest service life and therefore the lowest cost of ownership. We know the difference between a traditional thermal process and a hot-fill line, and can recommend the best sensors and controls for either. And our broad line of flow technologies allows us to provide optimal metering solutions for virtually every fluid you might be processing. 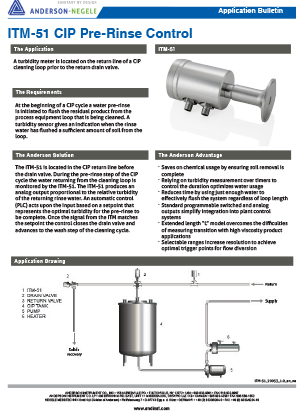 Fluid food processors often struggle with application challenges that are unique to the type of foods they manufacture. Higher viscosities mean higher pressure pumps, and often more pulsation and vibration. They can also create foam and/or coatings on sensors and probes that can render them inaccurate or even useless. Anderson-Negele again brings an application-specific approach with products and knowledge that solve these tough issues for our customers. And we are one of the only suppliers able to provide digital reference thermometers that meet the Code of Federal Regulations for aseptic processing of canned foods in retorts.